Sardanapale was a champion race horse in France, on the very eve of World War I -- his final win of his triumphant three-year-old year was the Prix Eugène Adam, held at the last meeting at Maisons-Laffitte before it was shut down as France mobilized. His impact as a stallion was greatly affected by the war, as many of his offspring were purchased at comparatively low prices by foreigners, especially Americans, and shipped overseas, where they would have a significant influence on racing and breeding beyond France. He led the sires list in France twice in the 1920s, and got a leading sire son in France, the Italian-bred Apelle, and an outstanding broodmare daughter, Zariba. Amongst his grandchildren were American, French, Italian and Argentinian champions galore, and two really important foundation broodmares, Tofanella in Italy, and Astronomie in France. His sire, Prestige (1903), was the son of Edmond Blanc's colt, Le Pompon (1891-1903), whose big victory was the 2,000 meter Prix Lagrange at Maisons-Laffitte. In the stud Le Pompon, who stood at Henri Mauge's Haras du Val d'Enfer, near Versailles, got two really outstanding offspring in his truncated time in the stud: Prestige, considered one of the best colts to race in France since Gladiateur, and Biniou, W.K. Vanderbilt's outstanding stayer at ages three and four and later a sire in Germany. Prestige's dam, Orgueilleuse, bred at Blanc's Haras de Jardy, was by Révérand, who, for Blanc, ran second to Common in the Doncaster St. Leger. Prestige was unbeaten in his two seasons on the turf. His owner-breeder, J. Ravaut, died, and he was purchased by American W.K. Vanderbilt, then headquartered in France, who placed him in training with William Duke; Duke claimed he was the best horse he ever trained. He did not run in the big classic races for three-year-olds, but despite this, he was so superior, beating all the best of his generation, that he was undisputedly champion of both his juvenile and three-year-old seasons. He typically broke in front, and led from start to finish, and when he did not lead, he had the speed to overcome any front-runners. An "average-sized" bay, he had "light and flexible" action, but was "bad-legged." At age two Prestige won all seven of his races, including all the big juvenile events, such as the Omnium de Deux Ans (6 furlongs, by 4 lengths) and the Critérium de Maisons Laffitte (6 furlongs) at Maisons-Laffitte, the Grand Critérium at Paris (8 furlongs, 4 runners), the Prix de Deux Ans at Deauville (6 furlongs), the Prix de la Forêt at Chantilly ( 7 furlongs, by 1 length), and the Prix Heaume at Maisons-Laffitte (8 furlongs, by 4 lengths with 5 runners). His total winnings that year were the highest ever won by a juvenile. At age three he won the nine races in which he was entered, including the Prix Langrange (Now Prix Boïard, 10 furlongs, by 1-1/2 lengths), the Prix Eugène-Adam (10 furlongs), the Prix du Prince de Galles at Paris (12 furlongs, won by 4 lengths), and the Prix Seymour at Paris (12 furlongs). He took two walk-overs that year: the Prix Fould in Paris, and the Prix Hédouville at Saint Cloud. Prestige was retired to Vanderbilt's Haras du Quesnay, but in 1913, perhaps disappointed with his offspring, Vanderbilt sold Prestige to Henri Mauge and Prestige was installed at Haras du Val d'Enfer, where he spent the remainder of his life. Prestige led the sire's list in France once, when Sardanapale put him on top, in 1914. Other than that, he was only moderately successful as a stallion, making the top ten in the sires list twice in succeeding years. His other noted runner was the filly Quenouille (1916, out of Queenie, by War Dance), a lucky winner of the Prix de Diane in 1919 and later an important foundation mare in the Edouarad Rothschild stud, Haras de Meautry. Prestige's son, Snob (1919, from May Dora by Isidor), bred by American John Sanford at Haras de Cheffreville and imported to the U.S., won the Long Branch Handicap and Withers Stakes and was second in the Belmont Stakes, later a modest sire at the Sanford Hurricana Stud near Amsterdam, New York. Snob's son, the good handicapper Clock Tower, got CCA Oaks winner Dawn Play. Prestige died in 1924 from a ruptured bowel. Sardanapale's dam, Gemma (1903), was by the outstanding staying son of St. Simon, Florizel (1885), and out of Agnostic, by the versatile, handsome, ill-tempered Rosicrucian, a horse that won at 2-1/2 miles. Nine years before Gemma, Agnostic dropped her brother Vedas (1902, by Florizel), who won the Two Thousand Guineas. Gemma, bred by Lady Meux, was purchased by Lord Derby and trained by George Lambton. She was a pretty good juvenile, winning two races, and placed second three times in six starts. Her wins included the Sandown Park Stud Produce Stakes (5 furlongs) and Goodwood's Lavant Stakes (5 furlongs), and she was second in Epsom's Acorn Stakes, the Ascot Biennial Stakes, and Newmarket's Fulbourne Stakes. At age three she did not win in nine starts, hampered by a "disposition that was far from placid," her best effort was second place in Lingfield's Winter Handicap. At age five she was covered by Carbine, and sold to Baron Maurice de Rothschild, who sent her to his stud, Haras de Champagne de Saint-Hilaire in Vienne, southwest France. In 1911, having been put to Prestige while he was still at Haras du Quesnay, Gemma produced her second and last foal, a blaze-faced dark bay colt at Rothschild's stud that was given the name Sardanapale. Sardanapale grew to be a big, tall colt, a bit backwards at age two with a lot of growing still to come. He was well-muscled and somewhat long-backed, like his sire, but unlike him, also very much on-the-leg, giving him a square body, to which was attached a long neck (the latter invariably passed on to his offspring). His underpinnings were somewhat light, and he was quite vertical -- photos just after his retirement show his fetlocks took a pounding. No one referred to him as beautiful, except when he was in motion, when his powerful gaskins made him a picture of "irresistible power." He was placed in training with James d'Okhuysen, Rothschild's private trainer after 1909, who had trained the baron's 1909 Grand Prix de Paris winner Verdun, and in 1905 had schooled Finasseur to his double wins in the Prix du Jockey Club and Grand Prix de Paris for Michel Ephrussi, a relative by marriage to the baron. 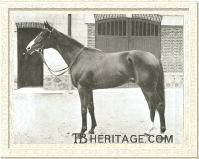 Verdun stood for several years in the Rothschild's stud, where he got a number of daughters later bred to Sardanapale, and in 1917 was sold to Mr Unzué and sent to his San Jacinto Stud in Argentina, and later was sold to Haras San Ignacio where he was frequently among that country's leading sires. Sardanapale was the only offspring of Prestige to meet, and perhaps surpass, his sire's accomplishments on the turf...he was commonly referred to in the French racing press as a phenomenon, and after retirement his owner referred to him in advertisements as "the best horse in the world." His generational rival was the striking chestnut son of Sans Souci, La Farina, who was owned by Baron Maurice's cousin, Baron Edouard de Rothschild. The year 1914, the last before the disruption of racing due to World War I, was a Rothschild year in French racing, and the battles between the two horses provided memorable meets, long discussed by French turfites. As a still-developing juvenile Sardanapale ran five times, and won three races, placing second once and third once. He won the Prix Yacowlef at Deauville (5 furlongs), beating nine other colts by three lengths. In the Prix Morny at Deauville (6 furlongs), he won again by three lengths, beating the then-backwards La Farina, their only meeting as juveniles. His next win was the Prix Seins et Oise at Maissons Laffitte (7 furlongs), beating well-regarded colt Guerroyante. In the big juvenile race, the Grand Critérium at Paris, he ran third, behind Le Grand Pressigny (later a good 3 year old) and Firleux III, but ahead of Alerte VI, who would win the Prix de Diane the following year. In the Prix de la Forêt he was second behind Le Grand Pressigny. He retired for the season second, behind Le Grand Pressigny, of the juveniles of 1913. At age three he ran eleven times, winning eight, placing second twice, and fourth once. His season started with the Prix Lagrange (10 furlongs), where he beat seven others, including the juvenile champion, Le Grand Pressigny, and the good colt Durbar, who would win the Epsom Derby that year. He ran against the older horses in the Prix Boîard, and was beat into fourth by the four year olds Nimbus, Isard II and Fidelio. He won his next two races: the Prix Hocquart (Paris, 12 furlongs), beating a field of eight others by two lengths, and the Prix Miss Gladiator at Maisons-Laffitte (11 furlongs). Then he met La Farina in the Prix Daru (Paris, 10-1/2 furlongs, three runners), where he was easily beat by the Sans Souci colt. The brilliant La Farina beat him again in the Prix Lupin (10-1/2 furlongs, 8 runners), but that would be La Farina's last success against Sardanapale, who outstayed him in their two future meetings. Taken to Chantilly Sardanapale won the 10 furlongs Prix Hédouville by three lengths, beating four other horses. Then came the Prix du Jockey Club at Chantilly over 12 furlongs, which La Farina did not contest. Sardanapale beat eleven other youngsters in this race, including the Epsom Derby winner Durbar. Next up was the Grand Prix de Paris (15 furlongs), where, on the eve of World War I, he met La Farina for the third time as a three-year old. The two colts sped through the race at a blistering pace, but jockey George Stern got Sardanapale (receiving weight from La Farina) up to beat La Farina by a neck (with Durbar third), establishing, in the process, a new record for the distance. If there was any doubt regarding Sardanapale's ability to outstay-- or perhaps, out-tough -- La Farina, it was settled in the next race eight days later, the Prix du Président de la République (12-1/2 furlongs) at Maisons-Laffitte, which he won decisively, also beating the older Nimbus and six others. His final race of the year was the Prix Eugène Adam (10 furlongs), held at the last meeting at Maisons-Laffitte before it was closed down for the duration of the war. Giving away fourteen pounds to the field of six others, he easily won the ten furlong race by five lengths. In 1915, the year he was four, there was no racing in France, so he retired from the turf, sound, having won over 1 million francs. Sardanapale was retired to Baron Maurice's stud, first at Chaumont en Vexin. In 1926 some of the stallions, including Sardanapale, and most of the mares and foals were moved to Maurice's new stud, Haras de la Fontaine at Semelle, near Aleçon (Oise), while some stallions and mares remained at Sardanapale's birthplace, Haras de Champagne de Saint-Hilaire. He was twice leading sire in France, in 1922 and 1927, and in the top ten of leading sires five other times, was once leading broodmare sire, and in 1926 he headed the list of sires of jumpers. Usually, his rankings on the sires lists were due to a large number of winners of modest races. In contrast, his old rival, La Farina, although he made the top ten five times, was never better than third in the sires list. La Farina was successful in getting a good sire son, Bubbles, leading sire in 1938, and Sardanapale was represented at the top of the lists in 1933 with his Italian-bred son, Apelle. Sardanapale's first crop was born in 1916, and was, due to the demands of war -- when all but the best horses were being fed into the grinding maw -- small. Baron Maurice's cousin, Baron Edouard de Rothschild, while successful at the Deauville sales, appears to have, comparatively speaking, focused primarily on breeding and racing his homebreds from his historic Meautry Stud in Normandy. Unlike Edouard, Maurice's focus was largely on sales -- why not, with the best horse in the world as your principal stallion? He kept and successfully raced a few of Sardanapale's youngsters, but most went to the block. For almost a decade after World War I, the baron's 30 or so youngters annually sent to Deauville put Sardanapale at or near the top in annual yearling sales averages. Baron Maurice was within or at the top of the leading breeders list in France for the same period, although seldom among the top ten leading owners. For several years after the war, the purchasers at Deauville were rich Americans, some of whom had long-standing ties in France through relatives or through ownership of estates there, and some of whom infused much-needed dollars into the French bloodstock industry through mass purchases of yearlings to be sent to the U.S., or through shipping their American and English mares from Great Britain to France for breeding. Several Americans, such as the Maryland Belair Stud owner, William Woodward, who had a marked "fondness" for Sardanapale, went back to the well in successive years, importing pregnant Sardanapale daughters into the U.S. So, while Sardanapale was a successful stallion in France through a fairly limited number of good runners and many modest ones, his lasting influence was disproportionately large in the U.S., where many of his daughters and sons ended up. Sardanapale offspring of the early 1920s, purchased in-utero or as yearlings and weanlings, also went to Argentina and England, Germany and Italy, and as his daughters matured, many, bred to leading stallions, were also bought for export. Neither of Sardanapale's two best European sons, Apelle and Fiterari, were able to get top class sire sons to continue the sire line. It is through Sardanapale's daughters and those of his sons that we see him in pedigrees today: Sardanapale was the sire and grandsire of three famous mares -- Zariba, and Tofanella and Astronomie -- that laid the foundations of the two most important mid-century racing studs in Europe -- Federico Tesio's Dormello in Italy, and Marcel Boussac's Fresnay-le-Buffard in France. His grandchilden included the top U.S. money winner in history to that time, and champion colts and fillies in the U.S., France, Italy, and Argentina. Apelle APELLE (1923) was a blaze-faced chestnut, probably the best racing son of Sardanapale, possessing both speed and stamina. He was out of the St. Frusquin daughter, Angelina, a mare that placed second in the Houghton Stakes at Newmarket in her two starts as a juvenile, and ran third in the 14 furlong Newmarket Oaks in her four races at age three. She was purchased in 1921 for 3,400 guineas at the Newmarket December sales by the noted Italian owner and breeder Frederico Tesio, who had yet to make a mark in the racing world beyond Italy. Angelina had been bred to Sunstar -- it turned out she was barren -- but it was probably her St. Simon blood, much favored by Tesio, and her conformation that triggered the purchase. She was sent to Sardanapale, and in 1923 produced Apelle; two years later she was sold off to Germany. APELLE won four of his six races in Italy and France as a juvenile, including the Triennale at Milano (1,000 meters), and the Critérium at Maisons-Laffitte (1300 meters). The next year he was the champion colt of his generation in Italy, and the next-best colt was Cranach, also owned by Tesio. In Italy Apelle won the Gran Premio di Milano (3000 meters) by six lengths, the Italian Derby (2400 meters), the Premio Firenze (2200 meters), and the Premio Principe Amedeo at Torino (2200 meters), but due to a communication problem with his jockey, ran second to Cranach in the Gran Premio d'Italia at Milano (2400 meters). In France he won the Coup d'Or at Maisons-Laffitte, but in the Grand Prix de Paris, taking the lead at the start, as he did in Italy, he was run down and finished out of the money. His race was so impressive, however, that Californian Richard McCreery, who lived in England, bought him for a rumored £15,000, and at the end of the season he went to England and placed in training with Henry Persse at Chattis Hill, Stockbridge. That same year Sardanapale's daughter, GALLERIA BARBERINI (from Galleria Borghese, by Signorino -- a full sister to two Derby Italiano winners), also bred and raced by Tesio, was the leading juvenile runner in Italy, having won the Premio Bimbi and the Premio Chiusura and one other race. At ages four and five APELLE ran eight times, and won five races, including the Sandown Anniversary Cup (twice) and Newmarket's Durham Stakes (both 2,000 meters), and Epsom's Coronation Cup (2,400 meters) and Newmarket's Bottisham Stakes, carrying good weight. He was then syndicated for a purported £26,000, and started his first season at the Littleton Stud, near Winchester, fully booked. His best son, Cappiello (1930), bred by Col. Giles Loder and sold to Lady Granard (a daughter of American Ogden Mills), who raced him in partnership with Lord Derby, was in his first crop. He won the Grand Prix de Paris and the Prix Lupin, and his wins put APELLE at the top of the French sires list in 1933. Cappiello was later a moderately successful sire. APELLE'S other good ones from his years in England were Amerina (1934,from Pastorella, sent to England from Italy to be bred to him), the champion Italian filly at age three; Irish Guineas winner Lapel; Good Deal, dam of the Epsom Derby winner Straight Deal; Lafcadio, winner of the Italian St. Leger; and Tesio's big chestnut filly Tofanella (1931, out of Try Try Again, by Cylgad), a stayer that won three of her six races at age three, including the inaugural Braume Band (German Brown Ribbon) at Monaco over 2400 meters, and Milano's Premio Boschetti (2000 meters), and at age four won two of her three races, including the Premio Resegone at Milano (2600 meters). Tofanella became a foundation broodmare at Tesio's Dormello stud. Her 1944 son Tenerani (1944, by Bellini) won 17 of his 22 races, including the Premio Merano, the Derby Italiano, the Gran Premio d'Italia, the Gran Premio di Milano, the St. Leger Italiano, and a host of other important races in Italy; at age four he took five races in Italy and in England both the Queen Elizabeth Stakes at Ascot and the Goodwood Cup. At stud at Dormello he got the the phenomenal horse Ribot. Tofanella's daughter, Trevisana (1945, by Niccolo 'dell'Arca), unbeaten in five starts as a juvenile, was champion juvenile filly in Italy, and was second to Tesio's Astolfina as the best filly in Italy at age three; she later bred four classic winners in Italy. Another daughter, Tokamura (1940, by Navarro), won the Premio Regina Elena and the St. Leger Italiano, and later bred three Italian classic winners, including Toulous Lautrec and Tommaso Guidi, both later stallions. In 1937 a syndicate of breeders in Italy purchased APELLE at auction for 3,000 guineas and took him back home; he died two years later, but his Italian crops included Fior d'Orchidea, winner of the Italian Oaks and later a very successful broodmare, dam of a good stayer, Oise, later a sire in Germany, and of the champion miler Orvieto, that went to stud in Canada. Fiterari FITERARI (1924) was out of the Irish-bred mare Miss Bachelor, by Bachelor's Double. Bred by Sir George Murray in 1919, Miss Bachelor was sold as a yearling to W.t. de Pledge for 950 guineas at Newmarket. Unraced, she was put to the stallion By Jingo!, and sent to the Newmarket December sales, where she was purchased by Baron Maurice, who sent her to his stud in France. There she dropped Titan, a colt that won races at ages two, three and four. Her next foal, by Sardanapale, was FITERARI, a brown colt, that Rothschild entered in the Deauville sales; he did not meet his reserve, and was later sold privately for the goodly sum of 100,000 francs to Paul Moulines, a comparative newcomer to French racing who had already won the Poule d'Essai des Poulains twice. Like his sire, FITERARI was slow to come to hand, securing only a third in one of his three races as a juvenile. At age three FITERARI emerged as one of the top two three-year-olds in France. His greatest rival was Mon Talisman (by Craig an Eran), owned by Argentinian E. Martinez de Hoz, and the only two times each lost was to the other colt. FITERARI won a mile race at Chantilly in his first start at age three. His next race was the Poule d'Essai des Poulains, which he took by half a length, beating ten other colts. Next up was the Prix du Jockey Club, where Mon Talisman beat FITERARI by two lengths in record time. This was followed by the Grand Prix de Paris, won by FITERARI in a thrilling finish, holding off a late charge by Mon Talisman to win by half a length. The two colts met again in the fall in the Prix Royal Oak. In heavy going FITERARI easily bested Mon Talisman by two lengths, with six other horses in the field, the third horse four lengths behind. Then came the Prix de l'Arc de Triomphe. In this race, FITERARI was pushed to run early, and Mon Talisman, biding his time, came up to win easily by two lengths, with Fiterari burned out and placing fourth. That was the end of FITERARI'S career on the turf. The general consensus was that Mon Talisman could not be beat up to a mile and a half, and that FITERARI was slightly better at the longer distances. FITERARI was sold through Tattersalls Française for a price rumored to be the highest ever paid by a French owner or breeder for a racehorse or stallion. His purchaser was Christian de Catheu, owner of Haras de Clairfeuille at Nonant-le-Pin (Orne). Fiterari was retired to stud there, already fully-booked to French mares for three seasons (a few bookings were left open for English-owned mares at 350 guineas each), where he was a good, but not top, sire. He reached third on the leading sires list in 1935 when Rarity won six races, including La Coupe d'Or, and he actually had more winners (28 of 67 races) than the two stallions ahead of him on the list. 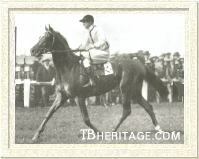 Another son, Casterari (1930), was a grand stayer that won the Grand Prix de la Ville de Vichy over 13 furlongs, beating a field of 20, and the Prix des Maréchaux over 1-3/4 miles, and was second by half a length in the Arc. His other good ones included Ravioli, Hutton, and Beaumontel, and in England Michoumy. He failed to get a good sire son to continue the line. He died during the war, in 1942. FITERARI'S sister, FERONIA (1929), bred two winners of races in Austria and Germany, and in 1936 produced Rosalba (1936, by Prince Rose), a winner that was later the dam of five winners, including of Chloris II (1941), a winner on the flat and over obstacles, and herself later a good broodmare. BAHADUR (1919), was out of Amazone, by Ladas. He was purchased by Léon Mantacheff, and won some good races for him, the Prix du Président de la République (1 mile-4-1/2 furlongs), the Grand Prix de Deauville, the Prix Edmond Blanc and the Grand Prix de Saint-Cloud (2500 meters). His half-sister was Guerrière, by Ossian, whose daughter by Sardanapale, FORTERESSE, became the dam of Kentucky Derby winner Broker's Tip (see below). Mantacheff also owned the Sardanapale son HAROUN AL RACHID (1919, out of Ardoise by Gallinule), that, after retirement, became a stallion at the government stud at Haras du Pin. BALMORAL (1925, from La Bahia, by Combourg) was bred by Mathieu Goudchaux, owner of Haras de Grisy-les-Plâtres (Seine-et-Oise). He was purchased at the Deauville sales for the record price of 600,000 francs by Count de Rivaud. He was one of the best colts in France as a juvenile, winning the Prix Opott at Saint Cloud by six lengths, and the Prix des Yearlings at Deauville by 2-1/2 lengths, and was third to Kantar in the Prix Morny and second to him in the Grand Critérium. He was seriously ill for months after his juvenile season, which was believed to have affected his racing at age three, but towards the end of the season he won the 2400 meter Prix du Conseil Municipal. He was later a good sire of high class jumpers. Charlemagne CHARLEMAGNE (1926, out of Reine Marguerite, by Ajax) was bred by Rothschild and purchased as a yearling at the Deauville sales by George Wildenstein for 125,000 francs. Another big, growthy, backwards Sardanapale colt, he did not race as a juvenile. In his first start at age three he was beaten by three lengths by Hotweed in the Prix de Boulogne, and ran second to him again in the Prix du Jockey Club. His big win was the 1 mile-5 furlong Grand Prix de Deauville in 1929, beating Kantara and twelve others. His full sister, REINE DE SABA (1922), bred on. Rothschild's French Guineas winner Diavolezza, by Le Sagittaire, was out of St. Astra (1904, by Ladas), the winner of the Prix de Diane for the baron. St. Astra established a significant family at Haras de Champagne de Saint-Hilaire, producing several half-sisters to Diavolezza by Sardanapale that became important broodmares. Diavolezza bred RHESUS (1924), by Sardanapale, a winner of the Prix la Rochette in France, and two sons that were exported. GAURISANKAR (1919, by Sardanapale), raced in France by Léon Mantacheff, was sold to India, where he ran successfully for J.C. Galstaun in 1925 and 1926. His wins included the Wellesley Plate (1-1/4 miles) at Calcutta, the Cooch Behar Cup (1 mile-3 furlongs, Calcutta), the 1-1/4 mile Carmichael Cup (Calcutta). and he ran third in one of the great Orange William's Viceroy Cups (1-3/4 miles, Calcutta). Another Diavolezza-Sardanapale son, MENZALA (1917) was sold to Poland, where he won the Nagroda Prezydente Rzeczypospolej (3200 meters) and the Nagroda Wielka Warszawska (2600 meters). Diavolezza's daughter, FARIZADE (1921) placed third in the French Oaks, and through her daughters was tail-female ancestress of Prix du Jockey Club winner and sire Prince Chevalier, Grand Prix de Paris winner Armistice, the good winner and sire Pharly, and the 1984 Nureyev son, Soviet Star (winner of the Poule d'Essai des Poulains, July Cup, etc.). LE GRAND CYRUS (1930, from Cydonia by Hurry On), was a big chestnut horse that did not run at age two, and at age three was a decisive winner of the Prix Hocquart by eight lengths, and a narrowly beaten second in the Prix Edgard de Charme. KANT (1932, from Kantara, by Cylgad), bred by Baron Maurice, was sold as a yearling to Mme. Georges Wildenstein. He won the Poule d'Essai des Poulains, but he could not stay in the Prix du Jockey Club or Grand Prix de Paris, and also failed to place in the Prix du Président de la Republique and the Arc, and despite his classic win, was well-down the list on the Free Handicap. AKENATON (1925) was out of the Premio Regina Elena winner Alciope, by Signorino. His breeder, Signor R. Gualino, ran him in Italy, and got some satisfaction when Akenaton won two races as a juvenile, and at age three was third to the outstanding filly Delleana, and then won the St. Leger Italiano. 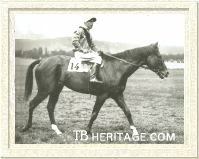 Another Italian son of Sardanapale's, AGERATUM (1928, from Agrippina, by Tredennis), also won the St. Leger Italiano, and five other races, in Italy at age three. SARMATION (1917), a bay colt out of Mousse des Bois, by Ajax, was bred by William Woodward in France, and imported to the U.S. as a yearling. He was not a successful stallion, getting only 36 starters, two of which won stakes, but his non-winning daughter Gravita (1924), also bred by Woodward, but at Claiborne in Kentucky, produced the 1936 Horse of the Year, Granville (1933, by Gallant Fox), winner of the Belmont, Lawrence Realization, Travers, and Kenner Stakes, and the Saratoga Cup, among other races. DESPOTE (1919), a brown son of the Verdun mare Drageé d'Or, was purchased by Lt. Col. Harry Hodgkin in 1926 and sent his Kings Cliffe stud in England, where he got some winners. COTLOGOMOR (1922), out of the unraced Mordant daughter Soda, was imported into the U.S. at age three, changing hands frequently, and won six races in 57 starts, including the rich New Orleans Handicap (lightly weighted at 107 pounds) at age five. He retired to stud in Missouri, where he was a modest regional sire. His sister, MAID OF ATHENS (1919) was also imported, in 1928, by Col. Phil Chin and installed at Shandon Stud, Lexington; she produced several low-level winners, including the long-running filly Wise Maiden (1937, by Wise Counsellor), that in 109 starts won 25 races and placed second 15 times. SOLPIDO (1922), born in Argentina, was out of the Finasseur mare, Stanzia, who was purchased by the wealthy Argentinian civil engineer Ignacio Unánue and sent to his Haras San Ignacio, about 70 miles from Buenos Aires, while carrying Solpido. He ran very well for Unánue in Argentina, establishing new Argentinian time records over five furlongs and also over a mile and a quarter. He was retired to San Igacio as a stallion. SARDANEZA (1925, from the Durbar daughter Lespedeza) was bred by American H.B. Duryea at his french stud. Gelded, he was sent to race over obstacles, winning the Grand Steeplechase de Lyon, and, imported into the U.S., won the Fraser Memorial Steeplechase. Sardanapale got some good race fillies in France, and some excellent broodmare daughters, both in France and beyond. 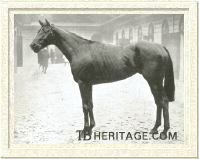 DONIAZADE (1918), was from the Cyllene daughter, Belle Vue, a non-winner. Bred by Baron Maurice, DONIAZADE ran fourth in the Poule d'eSsai des Pouliches, won by his cousin's filly Nephthys, by Sans Souci, but in the Prix de Diane at Chantilly, the first time the course had been used since before the war in 1914, she trounced twenty-one other good fillies, winning by 1-1/2 lengths. She went on to run against the colts in Lemnora's Grand Prix de Paris, but was nowhere. Retired to Haras de Champagne Saint-Hilaire, she produced a good filly in Dogaresse (1929), sold at Deauville to American J.D. Widener for 290,000 francs. Dogaresse won the Prix d'Arenberg at Longchamp (5 furlongs) as a juvenile. In the stud she bred the Rodosto colt Dogat (1940), another good juvenile and a classic winner that took the Poule d'Essai des Poulains, the Prix Jean Prat, the Prix La Rochette, and the Prix Jacques de Marois. ZARIBA (1919, from St. Lucre, by St. Serf), a grandaughter of Fairy Gold (dam of Fair Play in the U.S.) was one of Sardanapale's better race fillies, and one with great early speed. Purchased at Deauville for 45,000 francs by Marcel Boussac, she was a stellar juvenile, winning five races, including the Prix Morny at Deauville, dead-heating in the Grand Critérium at Ostend with the colt Parabole, and, at the end of the season, beating older horses over 8 furlongs in the Prix de la Forêt. At age three she ran out of steam in the Poule d'Essai des Pouliches by trying to lead wire-to-wire, placing fourth. She came back in the Prix de Diane in a field of 14 to place second to Pellsie by 1-1/2 lengths, having again starting her run too early. She went on to win the Prix Maurice de Gheest at Deauville (1400 meters), the Prix Jacque le Marois (1600 meters), the Prix Penelope, and the Prix Daru. In all, she won 13 of her 27 races through age four. She was retired to Boussac's Haras Fresnay-le-Buffard (Orne), purchased the year she was born, and where she was its principal foundation broodmare, and a mare of significance to the breed. Zariba ZARIBA produced four high-class runners by different stallions: Goyescas (1928, by Gainsborough), Corrida (1932, by Coronach), Abjer (1933, by Astérus), and Goya (1934, by Tourbillon). Goyescas, a good middle-distance horse won the Prix Boïard, the Prix d'Ispahan, the Prix Edmond Blanc, the Prix Ganay, and in England, the Champion Stakes and the Hardwick Stakes. Whatever promise he held as a stallion was left unfulfilled when he broke his fetlock running in the Prix du Président de la République and was destroyed. Abjer, who had his dam's speed, won Newmarket's Middle Park Stakes; he died after two seasons at stud, but he got Boussac's filly Caravelle (1940), champion filly in France at both ages two and three. The elegant and talented Corrida, France's Champion Older Mare at age 4, who had both speed and staying power, was good at age three, placing in big races, like the Arc, run against the colts, and outstanding at ages four and five, winning races in four countries, among them: the Prix de l'Arc de Triomphe (twice), the Grosser Preis von Reichshaupstadt, the Grand International d'Ostende (twice), and Ascot's Hardwick Stakes. Corrida bred only two youngsters, one of which died as a foal (the other was the Boussac Prix du Jockey Club winner Coaraze (1942, by Tourbillon), and Corrida herself disappeared -- probably killed -- during the war in 1944. ZARIBA'S son, Goya, was, like his dam, a speedy juvenile, winning the Gimcrack Stakes at York, and second in Newmarket's Middle Park Stakes. At age three he won the St. James's Palace Stakes, and was second in the Two Thousand Guineas, the Champion Stakes, and the Hardwick Stakes. At ages four, five and six, he won seven of his sixteen races, and was champion older horse in France at both ages five and six. He was in Boussac's stud in France, and got many high class stakes winners, including Nirgal (1943), the champion juvenile in France; Nirgal was out of Castillane (1936), a daughter of CASTAGNETTE (1924, by Sardanapale - Casquetts), making Nirgal inbred 3 x 3 to Sardanapale. Also in France Goya got Prix du Jockey Club winners Sandjar and Good Luck, the Poule des Pouliches winner Corteira, and English Oaks winner Asmena. In 1947 American Henry Knight bought him and shipped him to the U.S., where he got a number of stakes winners, but nothing as good as those he got in France, before he died at Darby Dan Farm in Lexington in 1958. Another ZARIBA daughter, L'Esperance, winner of the Prix du Calvados at Deauville, continued her female line with winning offspring in England and France: Miss France (1946), dam of two Irish Derby winners -- Talgo and Fidalgo -- and 1984 Italian Oaks winner Paris Royal were among her descendants. Euryale Some other Sardanapale daughters that won were the chestnut EURYALE (1923, from Framée), who beat a good field of juvenile fillies for her owner, the Comte G. de Chavagnac, in the Prix de la Masseliére at Chantilly; BELLECOUR (1925, from Lasarate by Alcantara), winner of the Prix de Malleret at Longchamp (2000 meters, for 3 year old fillies) for Marce Boussac; and LIKKA (1925, from Dame Mallory, by Nimbus), winner of the Prix Royaumont for Boussac. LIKKA later had great influence at Haras de Fresnay-le-Buffard by producing her bay filly Astronomie, by Astérus (Astérus was bred by Maurice de Rothschild and raced by Boussac, later standing at the Boussac stud). Astronomie won the Prix de Saint Firmin as a juvenile, and the Prix Chloe at age three, and placed four more times in her ten starts at ages two and three. In Boussac's stud she bred nine winners from ten starters, almost all terrific stayers, including Caracalla (twice year-end champion in France and Horse of the Year in Europe at age 4, winner of the Prix de l'Arc de Triomphe, Ascot Gold Cup, Grand Prix de Paris, Prix Royal-Oak, etc. 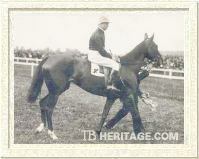 ), Champion older horse in France Arbar (Ascot Gold Cup, Prix du Cadran, King George VI Stakes, etc. ), and Marsyas (Prix du Cadran, four times). One of her daughters was English Oaks winner Asmena (by ZARIBA'S son, Goya, and so 3 x 3 to Sardanapale). This female line continues to the present through another Astronomie daughter, Arbele, a winner of the Prix d'Ispahan and other good races. HIMALAYA (1920, out of the Ladas mare, Mountain Lass) was a broodmare at Haras de Grisy-les-Plâtres (Seine-et-Oise), owned by Mathieu Goudchaux. There she bred Indus (1928, by Alcantara), who was sold by his breeder to Edward Esmond for 280,000 francs at Deauville. He was a very good juvenile, with a preference for heavy going, winning three of his five starts, including the Critérium at Maissons-Laffitte, and Longchamp's Grand Critérium. At age three he won the Poule d'Essai des Poulains. Retired to stud at Haras d'Ouilly in Calvados, he got the champion juvenile in France, Turbulent, later a sire in South Africa, Poule d'Essai des Pouliches winner Yonne, and other good runners, and Terka (1942), who became the dam of the two-time French Horse of the Year, Tantième, bred at Haras d'Ouilly and later standing there as a stallion, twice champion sire. Indus, and some of his offspring, including his good daughter Pindarella were seized by the Nazis in 1944 and shipped to Germany, where Pindarella won four races. Indus was one of many French horses that could not be located after World War II ended. TITANITE (1917), a half-sister to Diavolezza and out of St. Astra, was a winner of three races in fifteen starts. Through her daughter Tatoule (1925, by Alcantara), she was second dam of three stakes winners, including the filly Gossip, a winner of the Grand Critérium, and Fastnet (1933, by Pharos). Fastnet, bred and raced by Edward Esmond, won five races, including the Prix Greffulhe (beating Mieuxcé) and Prix Noialles, and in India in 1938-39, the Viceroy's Cup and the C.N. Wadia Gold Cup. Brought back to France in 1939 he was put to stud at Haras de Varaville, where he became a fairly successful sire of stayers and jumpers. In 1928 TITANITE was purchased by George Widener and served as a broodmare at his Erdenheim Stud; her U.S. daughter Tatanne (1931, by St. James) won the 1934 Jefferson Derby and later bred on. CASTAGNETTE (1924, from Casquetts, by Captivation), won one small race as a juvenile, and bred four winners for Marcel Boussac, including Prix Morny winner Cecias and Prix des Reves d'Or winner Aspara. Her daughter Castillane, as noted earlier, produced the champion juvenile in France, Nirgal, by Goya, also winner of the Great Yorkshire Stakes, the Princess of Wales's Stakes, and other races in England. In 1949 Nirgal was sold to the U.S., where he got 15 stakes winners. The good South African filly Enchanted Garden (1982) descends in tail-female from Castagnette. QUATRE SIASONS (from Quickly Off, by Pilliwinkie), produced Quartier-Maitre (1935, by Monarch), a winner of three races in France at ages 3 and 4, in England of the Lincolnshire Handicap at age five, and of the wartime Cahmbridgeshire Stakes Handicap at Newmarket at age eight. A number of fillies and a colt from Sardanapale's first two crops were purchased on consignment in France as weanlings and yearlings by American Delbert Reiff and imported into the U.S. at the end of 1917, where they were sold to various breeders to great effect on U.S. bloodstock. They included AGNES SARD (1917, Noreen Agnes by Juggler) and her yearling sister ALPHEE (1916), BIRD LOOSE (1916, Poule au Pot by Verdun), EPINGLETTE (1916, Safety Pin by Adam), LA BELLE HÉLÈNE (1916, Cape Wrath by Carbine), NIRVANA (1916, Beatitude by Bay Ronald), FILANTE (1916, High Flyer by Flying Fox) and the colt, BAIGNEUR (1916, Bain de Mer-Masque). In fact, for about ten years it seemed that Americans couldn't get enough of the blood of the "best horse in the world." In addition to these fillies and to the colts and geldings noted above that ended up in the U.S., other Sardanapale offspring sent there included ATYS (1923, Amazone-Ladas), FAUCILLE D'OR (1928, Luzerne-Ossian), EPHYRE (1924, Quadrille-Ossian), ARMIDE (1919, Emilie-Chaucer) and her sisters MAIMOUNA (1924) and THEODORA (1920), BADOURA 3RD (1922, Bell Vue-Cyllene), FORTERESSE (1926, Guerriere-Ossian), SEKHMET (1929, Prosopopée-Sans Souci) and her sister ZOHRA (1924), TITANITE (1917, Saint Astra-Ladas) and her sister CALLISTO (1919), LITTLE MUFF (1924, Mimuf-Minoru), and LA CANDUER (1918, Love-blink-Velocity) who was imported by A.K. Macomber and sold to B.B. Jones of Audley Stud in Virginia (she had two foals and died in 1930). Reiff dabbled in bloodstock and by the mid 1920s was managing American A.K. Macomber's Haras de Cheffreville, which had been established by the Montgomery family years before and purchased by Macomber in the late teens (Macomber also owned nearby Haras du Quesnay, purchased on the death of W.K. Vanderbilt). Reiff had a number of his own horses located at Cheffreville, and in the mid-1920s the Dark Ronald son Dark Legend, owned by M. Galstaun, and the aged Grand Prix de Paris winner Maintenon, owned by Macomber, were the principal stallions at the stud. Over a decade later Prince Rose, after several seasons in Belgium, joined the stallion roster there. Of the Sardanapale fillies imported into the U.S. in 1917, they were sent to the most prominent studs in the U.S., in Kentucky, Virginia, New York, and Philadelphia. Most were unraced, and most were successful broodmares. 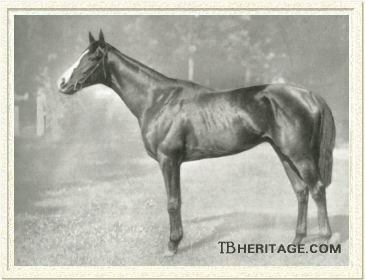 BIRD LOOSE (1916), bred by Rothschild, went to Colonel Bradley's Idle Hour Stock Farm where she ran briefly without distinction. 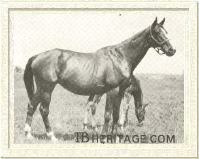 Then she bred Headcover (by Helmut) in 1922, ultimately a gelded winner of $8,530. Bradley didn't care for Headcover, and he sold BIRD LOOSE, in foal to Black Toney, to John Ireland. Col. Phil Chinn liked the resulting coal black filly when he saw her, and purchased both her and BIRD LOOSE for his Himyar Stud in 1923. When a yearling, the filly, Black Maria, was sent to the Saratoga sales, where she was purchased as a yearling by W.R. Coe for $6,200. This great champion filly of 1926 was a backwards juvenile, being growthy and eventually reaching over 16 hands. At age three, with great power and scope, she ran 17 times, beating the fillies, then the colts, and finally the handicap horses; her wins included the Kentucky Oaks and Illinois Oaks, the Twin City Handicap in record time over a mile and a quarter by four lengths at Belmont, and the Aqueduct Handicap. She died after producing one modest winner, the filly Black Queen, second dam of Preakness and Withers Stakes winner and sire Polynesian (1942); Air Forbes Won (1979) descended from Black Maria in tail-female. EPINGLETTE (1916) went to Harry Sinclair, for whom she bred Superlette (1922, by Superman), a winner of $28,490 and 19 races in 35 starts, including the Beldame Handicap at age two and the Bayshore Handicap and Fall Highweight Handicap at age 3. In 1925 EPINGLETTE dropped Mowlee (by Lucullite), a bay colt that won 13 of his 40 starts and $37,337; his wins included the Southampton Handicap at age three, and the Excelsior, Prince George, and Robert M. Sweitzer Handicaps at age four. LA BELLE HÉLÈNE bred six winners from six foals. Her two stakes winners, bred by C.T. Fisher, owner of Dixiana Stud in Lexington, were the High Time filly Essoff (1930), a winner of 13 races in 26 starts, including the Latonia Oaks, and at age four, the Clark Handicap, and the Crusader colt Chasar (1931), a long-running handicapper (127 starts to age six) that won 24 races, includng the Cincinnnati and Avondale Handicaps at age three, and the Coral Gables Spring Handicap at age five. FILANTE (1916), who injured her hocks in the Atlantic crossing, was another of the Reiff consignment that did not race. She went to William Woodward's Belair Stud, where she became a significant matron, breeding seven winners from twelve starters, including five stakes winners. One was Gaffsman (1923, by Jim Gaffney), winner of 22 of 84 races in Canada for his owner Mr. Seagram, and a very good juvenile winner of the National Stakes, the Nursery Plate Handicap, the Victoria Stakes and other good races, and later of the Toronto Autumn Cup Handicap (twice), the American National Turf and Field Handicap, and the Marquette Handicap, among other races (later a sire in Canada). FILANTE'S other good foals included Filemaker (1924, by Ambassador IV), winner of the Maturity Stakes at age four; Frisius (1926, by Star Hawk), winner of the Ontario Jockey Club Cup, the Stanley Produce Stakes, the Merchants' and Citizens' Handicap and six other races; Flivver (1922, by Jim Gaffney), Flying Gal (1927, by Sir Gallahad III), winner of the Schuylerville Stakes and two other races, and her brother, Fenelon (1937). Flying Gal was sent to England and later produced Boswell, winner of the 1936 Doncaster St. Leger for Woodward, and his half-brothers, Gainly (1935, winner of the Park Hill Stakes), Hypnotist (1936, King Edward VII Stakes), and Schackleton (1946, winner of the Dwyer Handicap in the U.S.). Flivver (1922), was third dam of the sire Heelfly (winner of the Laurel Stakes, Potomac Handicap and 16 other races and dam's sire of T.V. Lark), and ancestress of some good stakes winners in the U.S. and Italy, and still another Filante daughter, Fiery Cross (1942, by Flares) produced Canadian Derby winner Argent (1953). Fenelon, the best of FILANTE'S brood, won one race in 13 starts at age two, and at age three won six of his eleven starts--he was ill for the Kentucky Derby and was stricken from his other classic engagements, but went on to beat everything, carrying heavy weights in such races as the Empire City Handicap, the Lawrence Realization, Saratoga's Jockey Club Gold Cup (by ten lengths). At age four he went on to win six more races, including the New York Handicap (2-1/4 miles), setting a new American record for the distance at 3:47, the Gallant Fox Handicap at Jamaica (1-5/8 miles, by six lengths), and Belmont Park's Manhattan Handicap (1-1/2 miles). He was a dismal failure at stud. Other Sardanapale daughters imported in 1917 were AGNES SARD and her year-older sister ALPHEE. ALPHEE went to the Sanford Stud in Amsterdam, New York, where she got several long-running low-level winners. AGNES SARD went to Woodward's Belair Stud in Maryland. She bred five winners from ten foals; her first, Peanuts (1922, by Ambassador IV), was also her best. A small first foal, he was a tiny perfect model with a beautiful head, the Sardanapale length of body and neck, and good bone. Purchased as a yearling by R.L. Gerry, he won three purses and was unplaced ten times in sixteen starts at age two, but at age three he beat the big boys in the Edgmere, Huron, Knickerbocker and Saranac Handicaps, and the next year his wins included the Bowie, Champlain, Empire City and Pierrepont Handicaps, where he was generally giving away weight. At age five he was triumphant in the rich Brooklyn Handicap, and the Brookdale and Empire City handicaps. He was retired to Gerry's Aknusti Stud in Delhi, New York, where he got Top Row (1931). Top Row was a winner in California of the San Francisco and Santa Anita Handicaps, and in the east of the Empire City Handicap, Massachusetts Handicap, the Narragansett Special, and a number of other races; he was later a moderately successful sire. Black Maria's great success caused a minor stampede by American owners to purchase more Sardanapale daughters. So, in 1926 E. R. Bradley -- hoping to get another Black Maria that would not slip through his fingers -- commissioned the British Bloodstock Agency to purchase FORTERESSE (1926), a bay filly bred by Baron Maurice from the mare Guerrière, by Ossian, and CALISTO (1919), a half-sister to Rothschild's French Guineas winner and great broodmare, Diavolezza, a daughter of the Prix de Diane winner Saint Astra (1904, by Ladas), the latter also second dam of Marcel Boussac's classic winner Astérus (later a good sire and top broodmare sire). CALISTO never did much...that was left to other Saint Astra and Diavolezza daughters by Sardanapale, such as TITANITE and FARIZADE. FORTERESSE, who cost Bradley about $5,100, got the flu and was never trained. In 1929 Bradley put her to Black Toney and in 1930 she dropped her first foal, Broker's Tip. He was not a stellar runner, and was still a maiden when he won the Kentucky Derby by a nose, "possibly the worst field ever," of 1933, a race further marred by a physical battle between his jockey and the jockey of Head Play in the lengths just before the finish. Broker's Tip began to pop green osselets soon after the race, but ran in the Preakness, finishing well down the course, and in the fall was last in a handicap at Laurel and eight out of ten in the Maryland Handicap. His sole win was the Derby. Broker's Tip was leased to Admiral Cary Grayson and stood at his Blue Ridge Stud in Virginia, although little use was made of him, and he returned to Bradley when Grayson died in 1938. After that he was sold for a paltry $1,400 at the fall Lexington sales, purchased for Californian F.P. Orsatti, and later stood for a while at the Half Circle Club Ranch in Wyoming. Back in California, he was donated to the University of California, Davis, where he died. Before he left Virgina, he got a handsome bay colt out of the On Watch mare, On Hand, that sold to Mrs. Isabel Dodge Sloane, owner of Brookmeade Stable in Virginia. The colt, Market Wise, was a poor juvenile runner, failing to place in most of his races, and winning two small races for new owner Louis Tufano. But then, oh, then, at age three, in a hard campaign of 26 races, he won 11, and placed second or third ten more times: his wins included the Wood Memorial, the Gallant Fox Handicap, the Jockey Club Gold Cup, and many other great races. He was later a moderately successful sire and got the grand stayer To Market, among other good ones. FORTERESSE later bred Billionaire, a Black Toney colt that won 15 races in 50 starts, and through her daughter Bleebok (1941, by Blue Larkspur), was fourth dam of Epsom Derby winner and sire Roberto (1969, by Hail to Reason). Another American who purchased a Sardanapale daughter from Haras de Champagne de Saint-Hilaire in 1926 was Texan W.G. Waggoner, who had purchased BIRD LOOSE, Black Maria's dam, after her daughter's great success. He secured AQUA VIVA (1919, from the baron's mare, Quadrille, by Ossian). She had already produced Francisque, a winner in England in 1925, and was in foal to Rothschild's stallion Cylgad. She did nothing, but her sister, AMPHRITE (1921), became a tail-female ancestress of winners in the U.S.
LITTLE MUFF (1924), out of Mimuf, by Minoru, won one race in twelve starts in France, and then was purchased, in foal to Ramus, in 1928 by J.N. Camden and brought to his Hartland Stud in Versailles, Kentucky. At the 1931 Hartland Stud dispersal at Saratoga she was purchased for the goodly sum of $10,000 by Mrs. Somerville at Montpelier, Virginia, and ended up producing two stakes-winning steeplechasers: Farragut (1936, by Annapolis), winner of 11 races in 69 starts, including the Battleship Steeplechase Handicap and the Thornston Stakes, and his gelded brother, Ahmisk (1939, by Blenheim), winner of ten races, including the Glendale Steeplechase, the Harbor Hill Steeplechase, and the International Steeplechase. FAUCILLE D'OR (1928), another product of Haras de Champagne de Saint-Hilaire, and a close relative of BIRD LOOSE, was another Sardanapale daughter shipped off to the U.S. She ended up in the stud of Mrs. John Hertz, where she became the dam of Elpis (1942, by Blue Larkspur). Elpis, raced by William Helis, was pretty good at age three, winning the CCA Oaks, and second to the much superior Gallorette in the Delaware Oaks. At the age of five she proved to be an outstanding staying mare (although not as good as the imported Miss Grillo), winning the New Castle, Molly Pitcher, Comely, Hannah Dustin, Miss America, and Edgemere Handicaps. In all, she won 17 good races in sixty starts. In the stud Elpis bred one stakes winner from three foals. SEKHMET (1929), was one of several daughters out of Prosopopée, by Sans Souci, sent to the U.S., but in terms of impact, she was the best of them. She had run without placing in France, and was imported by William Woodward for his Belair Stud. She bred nine winners. Woodward sent her daughter Booklet (1938, by Sir Gallahad III) to England where she won Newmarket's Pampisford Stakes and in the breeding shed produced six winners. Woodward retained SEKHMET'S filly Segula (1942, by Johnstown), and in 49 races at ages three and four, she won nine of them, and was third behind another Sardanapale grandaughter, Elpis (out of FAUCILLE D'OR), in the CCA Oaks. Segula was the dam of Sabette (1950, by Alsab) -- a good filly that won the Alabama Stakes, the Diana Handicap and Pimlico's Gallorette Stakes, and four other races -- and of the big, handsome Nashua (1952, by Nasrullah), champion two year old, and U.S. Horse of the Year at age three, and dam's sire of the champion stallion Mr. Prospector. Other Prosopopée daughters by Sardanapale that ended up in the U.S. were MYCENE (1923), ZOHRA (1924), and TANIT (1934); they all bred minor winners. ELEUSIS (1922), another of her Sardanapale daughters, was a stakes winner in France for Rothschild, and was not exported to the U.S.: she won two of her six starts as a juvenile, and placed second in the other four, and at age three she won the Prix de Saint-Roman (1800 meters) at Longchamp and the Prix de l'Yser (1300 meters) at Maisons-Laffitte, and ran second in the Prix des Chênes (1600 meters). Marguerite de Valois (1919, by Teddy) was a daughter of the great mare Plucky Liege. Her dam was carrying her when her owner, Lord Michelham, died in January of 1919, and she was purchased by Jefferson Cohn, the owner of Teddy. She was brought to the U.S. in 1929 for Ogden Mills' and Mrs. H.C. Phipps' Wheatley Stables, carrying a Sardanapale filly, MADEMOISELLE DE VALOIS (1929) that was unraced, bred four winners, and became third dam of the 1964 U.S. champion horse Roman Brother (1961). Marguerite de Valois' French daughter, SARDANA (1927), by Sardanapale, won four races at the age of four, and bred four winners, including James Rothchild's Ascot Gold Vase winner Rondo (1933, by Bolingbroke). BARANDILLA (1921), born in Argentina, was from the Le Sagittaire daughter Boudra. Boudra was purchased, like Stanzia (dam of SOLPIDO), both in foal to Sardanapale, and shipped pregnant to Ignacio Unánue's lavish Haras San Ignacio. BARANDILLA was a stellar broodmare at San Ignacio; bred at age three to Verdun, purchased from Baron Maurice and imported from France, and later bought by Unánue some years before. Her 1925 colt, Barranquero, won a number of races, including the Premio Miguel A. Martinez de Hoz. The pretty good, but unlucky, English runner, Alan Breck, joined the San Igacio stud in 1924, and in 1925 and thereafter BARANDILLA was put to him with superior results. BARANDILLA'S 1930 filly, Barranquilla, won the Premio Ignacio Correas and six other races, including the Premio Perú twice. Her sister, Barrancosa (1935) also won the Premio Ignacio Correas, along with eight other races and four in the U.S. Their brother, Banderin (1939) was Alan Breck's best son, and the best of his generation, winning 13 races, including all the big ones, such as the Gran Premio Nacional, San Isidro, Grand Premio Carlos Pellegrini, and so forth, and in Uruguay the Grand Premio José Pedro Ramirez; unfortunately he died before his first breeding season. BARANDILLA'S tail-female line, with more classic winners, lasted in Argentina through the twentieth century. Another Sardanapale daughter, ARETHUSE (1917), out of the Galopin daughter, Dainty, also went to Haras San Ignacio, where she became second dam of Agraria (1942-by Camerino, from Agresiva by Alan Breck), winner of Las Oaks. A close relative to ARETHUSE, HILLAH (1922, by Sardanapale), out of a Dainty daughter, Orietta, also went to Argentina and became the dam of Heil! (1936, by Congreve, subsequently and understandably re-named Yamille), winner of the Gran Premio Seleccion and the Polio de Potrancas that was given top honors as the best filly of her generation. Sardanapale died in November, 1934.